I have a busy week ahead of me! Besides a dentist appointment and a hair appointment, I have two classes coming up, and we're going away for four days of camping in our new fifth wheel the day after my last class! Also, I'll be away when I usually work on my newsletter, so I'll have to get that done this week as well as blog posts for the days I'll be away! Phew! So I was busy on the weekend making sure that I had samples ready for my two classes. One is a Christmas Buffet class, and I needed 8 samples for that. That really taxes your Christmas supplies, I can tell you! I had to rely on the products in the Annual Catalogue right now, plus a few retired products that I wanted to use up and quite a few of the products from the new Holiday catalogue, which doesn't go live until Sept. 1. So I was using Past, Present and Future products to prepare for this Buffet class. Hmm! Sounds like a good Christmas ghost story to me! What do you think? 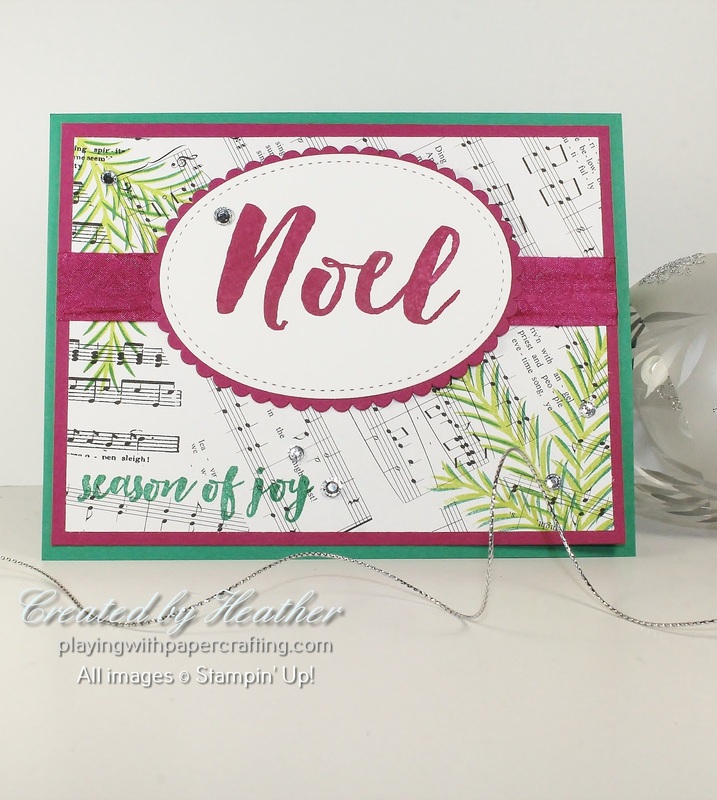 This card uses the stamp set, Christmas Pines, which was first featured in the 2016 Holiday Catalogue and which is now still available in the current Annual Catalogue. 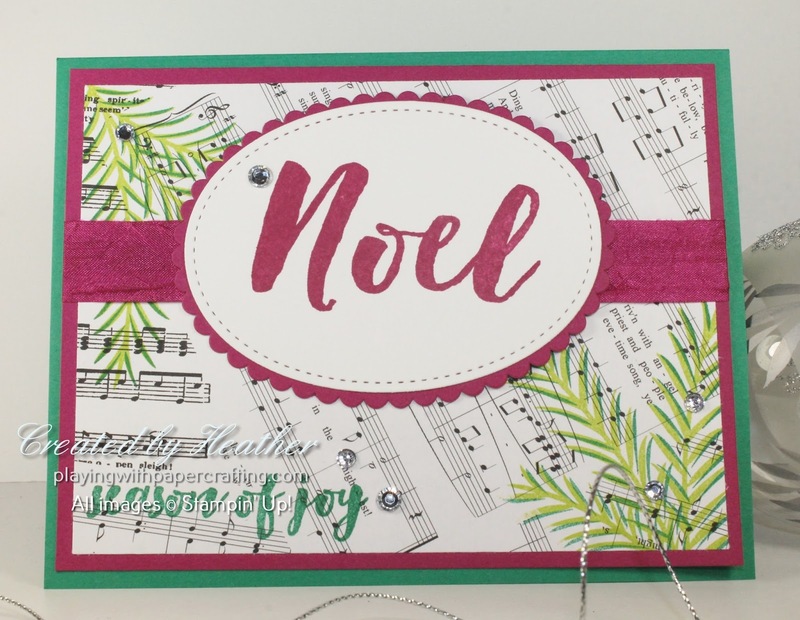 It has some great features including the two-step stamping fir branches, which I've done here in Emerald Envy and Lemon Lime Twist, and some distinctive sentiments such as the large Noel and the Season of Joy! The background DSP is called *Merry Music, which is from the new 2017 Holiday Catalogue. 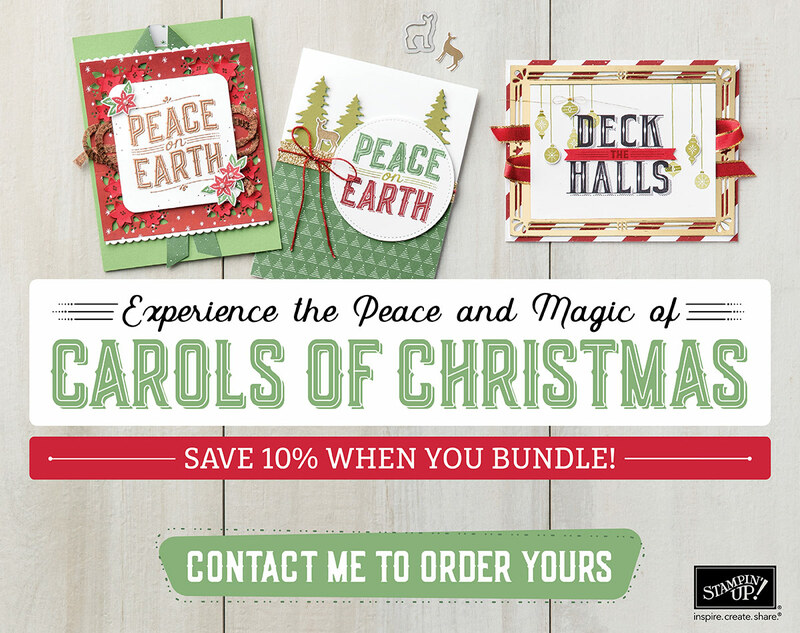 It is a Specialty Designer Series Paper and feature pages of sheet music and snowflakes on a thinner paper. You get a lot for your money with this set, so it's a really good deal. I stamped the fir branches right on the DSP using Emerald Envy for the darker ink and Lemon Lime Twist for the lighter colour. The small sentiment is also stamped, in Emerald Envy, right on the DSP. The Noel is stamped on a stitched oval shape in Berry Burst and backed with some Berry Burst cardstock, using a scallop oval shape from the Layering Ovals Framelits. It's mounted over a Berry Burst Crinkled Seam Binding ribbon. The card is finished with a sprinkling of rhinestones. *Products from the upcoming 2017 Holiday Catalogue, available for order starting Sept. 1. The background for this card is also from the *Merry Music Specialty Designer Series Paper, with a kind of snowflake design. The card front is made from some old, old, retired Brushed Gold Cardstock that we used to carry. 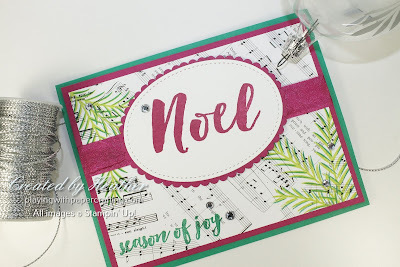 If there's something I wish Stampin' Up! would bring back, this would be it. It adds such a sophisticated elegance to cards. It also came in Silver. 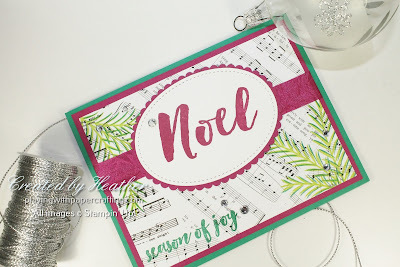 But I've used a future product from the new Holiday Catalogue on this card and that is the *Winter Wonder Embossing Folder! It's a large snowflake pattern intended to be more of a focal point than a background. It shows up wonderfully in the Brushed Gold cardstock. The ribbon is from our past Occasions Catalogue and is no longer still available. The die cut sentiment is from a retired set called Wonderful Wreathe Framelits. Before die-cutting, I placed the Basic Black cardstock on some Multipurpose Adhesive sheets, and once the word was die cut, all that was needed was to remove the backing and it became a sticker that was easily adhered to my project. The Gold Faceted Gems added some much needed interest and balance to the design.